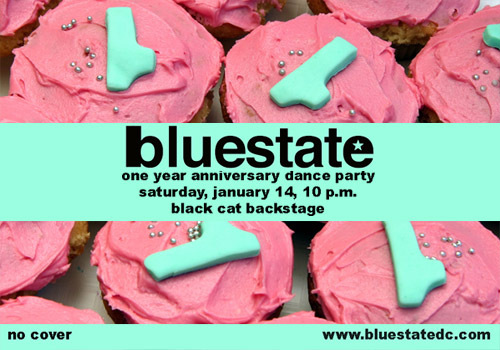 We would be delighted if you joined us on January 14 at the Black Cat to celebrate our first birthday. The party will feature the return of DJs DCSOB (Chicago) and WeirdCurves (Tampa) and maybe even cupcakes. We'll be spinning the songs that made you dance in our first year, plus new ones that will make you dance in the year to come. 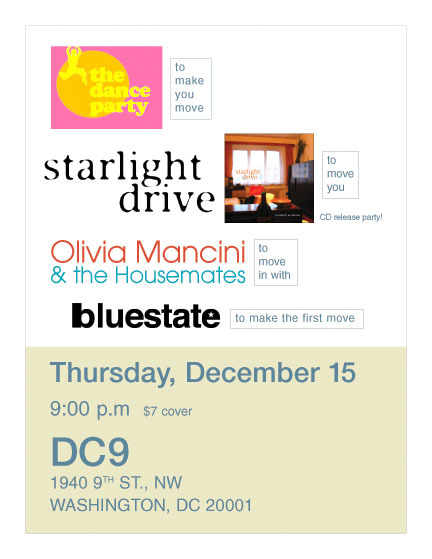 Come by DC 9 on Thursday, December 15, for local bands The Dance Party, Starlight Drive and Olivia Mancini & the Housemates. The bluestate DJs will be spinning before the show starts and between bands.